Call me crazy, but I love my Southern cooking heritage. There is something comforting about a platter of fried chicken, mashed potatoes with sawmill gravy, fresh homegrown sliced tomatoes and a side of fried apples to give a little sweet to the savory Southern goodness. Add a basket of homemade biscuits and cornbread and you will not have a problem getting the kids to the table and away from those Youtube videos and Xbox games. I am absolutely sure some of you are rolling your eyes at the word fried about now. But honestly, having a wonderful piece of fried chicken once in a while is worth it. Especially when this means your family is sitting at the supper table together. I have always loved fried apples. It was a regular treat for me at the local country-style restaurant. Southerners consider fried apples a side dish, right along with green beans and corn on the cob. I was devasted when I moved to California and could not find a local restaurant that sold my Southern favorites. I will not lie, it created a few tears of homesick more often than I am willing to admit. I cried when I asked my husband to take me out for a plate of veggies, which is Southern code for an array of slow cooked and fried vegetables on a big plate that most often had a slab of cornbread and some kind of homemade pickles. The cafe at a famous, FAMOUS, drive in style restaurant handed this gal a heaping plate full of steamed broccoli, cauliflower, and carrots. I fell into tears at the table and demanded to go home right then and there. Home to my beloved Tennessee and its world famous bbq and home cooked vegetables! After I got over myself, I made a promise that my kids would experience Southern cooking here in California. I have since taken advantage of the array of fresh fruits and vegetables that are here in my new home state. I also have learned that I can have Cornbread Dressing and Fresh Cranberry Sauce year round. Thanks to a good freezer, I keep frozen cranberries ready for cooking anytime. I was making my recipe for fried apples and thought, wow this needs color. So I added a cup of Cape Cod Select Frozen Cranberries! It doubled the yumminess of the recipe and brought gorgeous red to the dish. The apples are generally a nice golden yellow with a beautiful glaze but lacked color contrast, which I love when serving dishes. It turned out so beautiful. 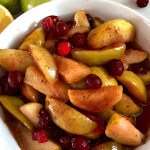 But honestly, it was the added tartness of the cranberry that brought my favorite southern apple dish to a new level. 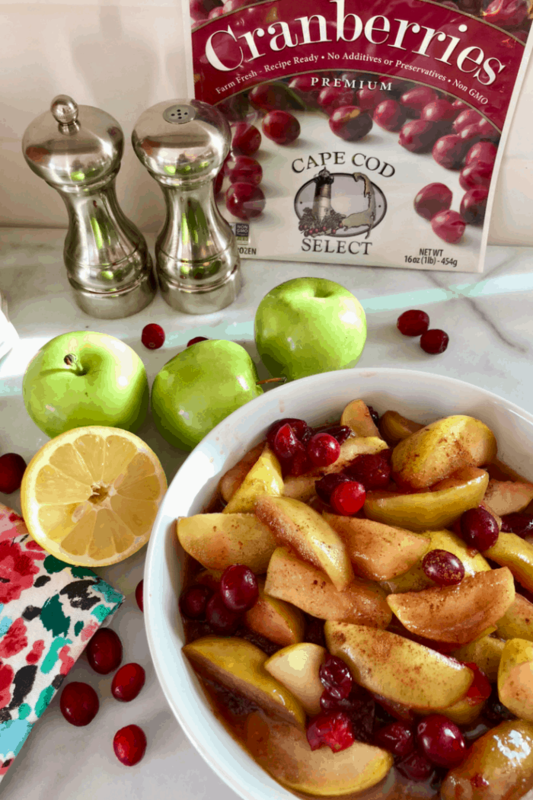 I am sharing my Country Style Fried Apples and Cranberries Recipe here today! Warning, this recipe is ridiculously delicious. 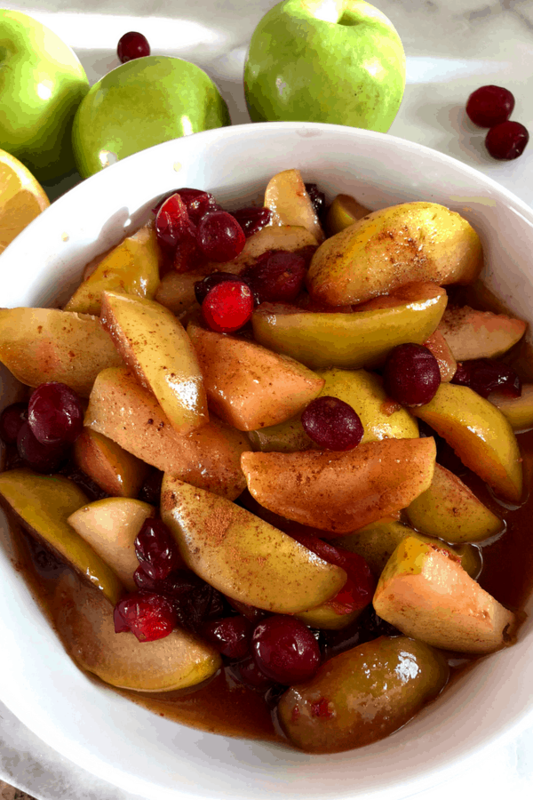 You are just going to love these tender, fried apples with the added yumminess of cranberries. Mmm, good. If you love Southern cooking check out my other recipes here. Southern Fried Cabbage, Country Style Potato Salad, and Simple Southern Tomato Gravy. 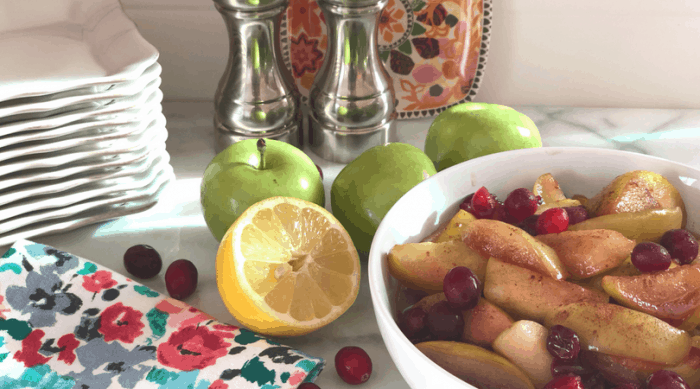 A yummy Southern recipe with the added zip of fresh frozen cranberries. Crazy delicious and a side dish your guests and family will love. Add apple slices and stir. Cook until apples are tender, 5 to 8 minutes. The cranberries will start to pop. Give it a little taste to see if you want to add the salt. I feel that salt brings out the flavors of the contrasting fruits! Serve as a side dish with any meat but especially chicken, fish, and pork. This also makes a great ice cream dessert dish. Just a scoop or two of ice cream and a 1/2 cup of the fried apples with cranberries. Yum! Don’t miss other favorite recipes! How about some yummy Sriracha Chicken! HI there! Sounds like a great holiday side dish. The instructions call for sugar, but I don’t see it listed in the ingredients. How much sugar it needed? Thanks! oh my heavens! I huge oversight on my part. It is a 1/2 cup sugar, you can sub out for brown. 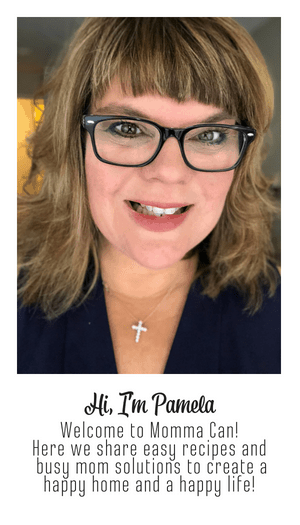 I am testing it with Nunaturals sugar substitute this week!